Beer Fellows: Beer Links for B-Ball fans, Romans, and the Irish! 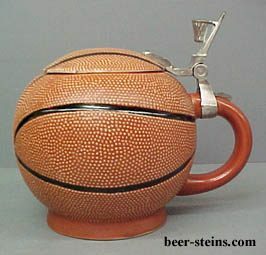 Beer Links for B-Ball fans, Romans, and the Irish! this is the stein for you. We have the start of March Madness, the Ides of March (also known as my anniversary), and St. Patrick’s Day. There is a lot of craziness happening this week so off we go! Speaking of brackets, WaPo is working through theirs. We took a totally different approach, so come back tomorrow to see what we have wrought. Want to celebrate your Irishness this weekend? Skip the green beer and dive into these instead! Do it right and you can unlock your Luck of the Irish badge on Untappd. A good use of twitter… or the best use of Twitter? I spent a good fifteen minutes wondering about the chain of events in this article and all the little details. I love beer crime like this. This is a cool map. Our southern beer friends in Alabama & Georgia are sure getting the screws turned on them though. Seems like a no brainer to me. If it was me I would try to distribute it down in the Outer Banks also. No surprises here. Though with all the effort they put into this why not just brew better beer? Whew! That was a close one. I wonder how many gallons of brew are lost a year due to accidents. The white whale that is KBS. The Canadian Breakfast Stout is even more elusive. One day though I will have them. After all the lying I did last week, this week I am not committing to anything other than our beer brackets and a spring seasonal review. What I can promise you is that the JGF team working hard to get back on track both with the podcast and a regular posting schedule. There may be a few more bumps in the road but we are getting things squared away. Thanks as always for stopping in and thanks even more for your patience.